2 charming quiet guest rooms with bathroom and WC. 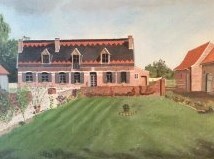 The Paardenhof Guesthouse, dated from 1912, is located in the heart of Flanders. Free WI-FI, closed parking, patio and garden.